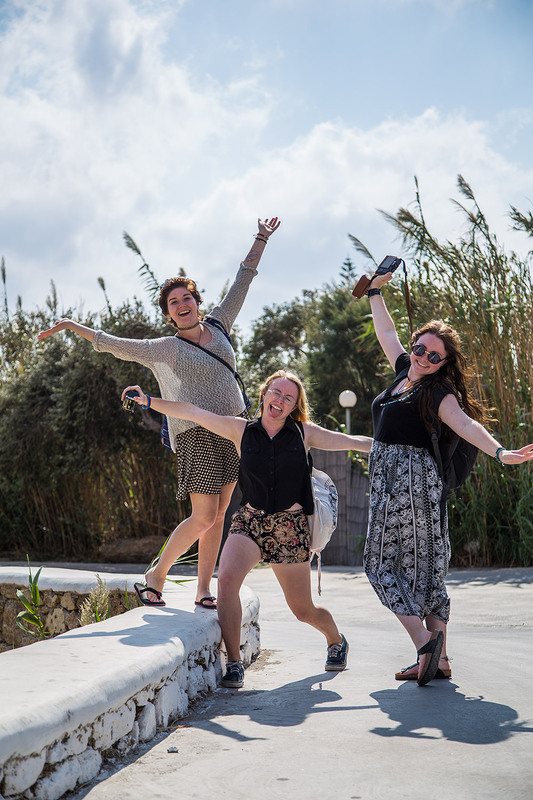 We ferried out from Athens to Mykonos with our new Aussie friends Phoebe and Matilda. We were staying a little far away from each other and didn’t plan much into the day so we relaxed at our hotels on the first day. 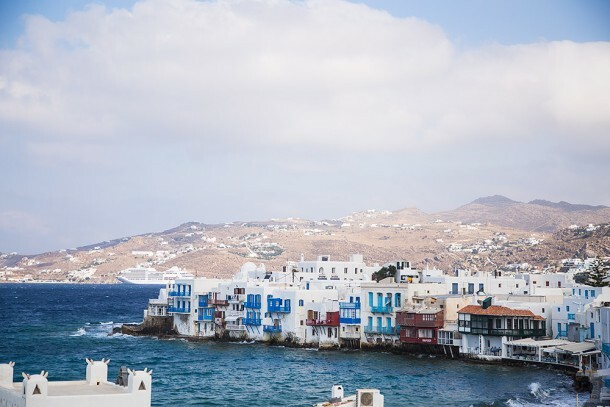 We usually don’t book hotels but in the Greek islands they tend to be significantly less expensive, especially since it was off season. This is the view from our room. 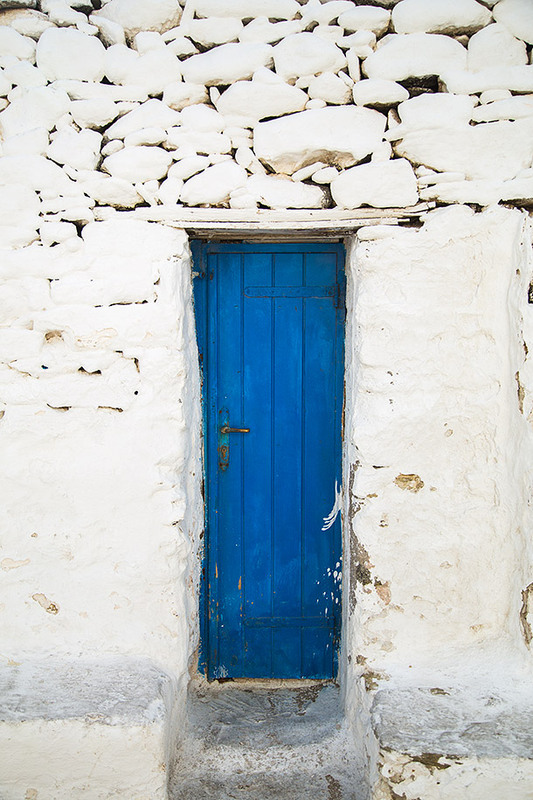 Walking in with these wide open doors that allowed light to flood in and bounce off the white walls was just a gorgeous welcome to Mykonos. 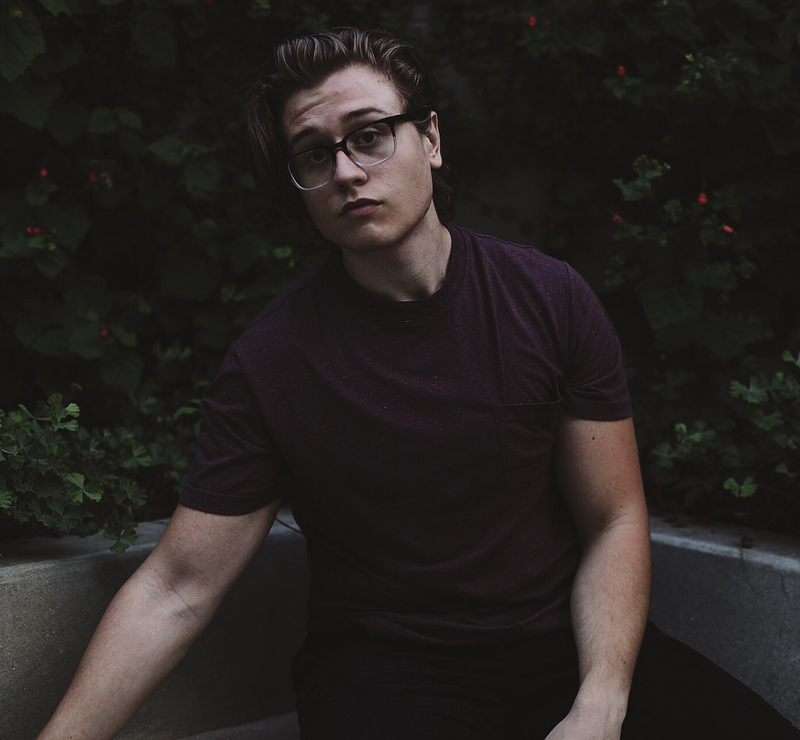 That night Matti and I ate at a restaurant near our hotel, literally a few steps away actually. 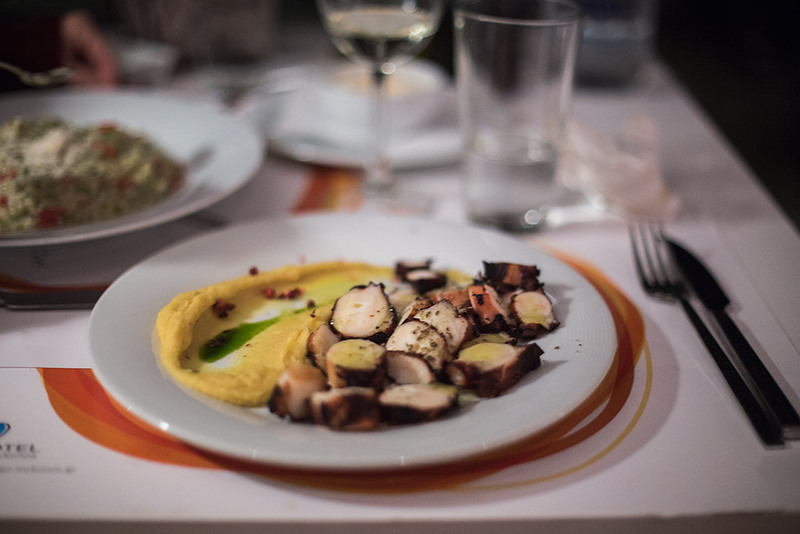 I ordered the grilled octopus with chickpea puree which was surprisingly good. I would hope so since our waiter went into full detail on how to prepare and octopus which involves slamming it alive against the ground exactly 100 times. Now I know how to properly prepare fresh live octopus. As we were about to leave I took a look at the dessert menu and remembered someone telling me that I had to try the honey soaked greek donuts. Unfortunately they were too expensive for us so I asked for the bill. 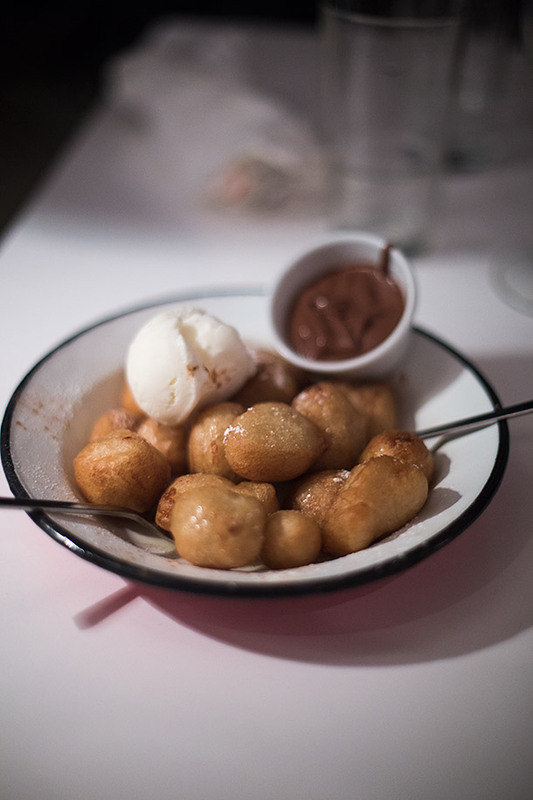 So the waiter came out with the honey soaked donuts free of charge, as well as the bill, asking us to “please try them, they’re traditional and really good.” Ah Greece, you and your people are simply enchanting me. These were served with nutella to dip in and house made gelato on top. Each bite of the honey drenched donut was like floating in the air. If food could make you high this would be outlawed. The next day Matti and I planned to to meet Phoebe and Matilda at the famous windmills. 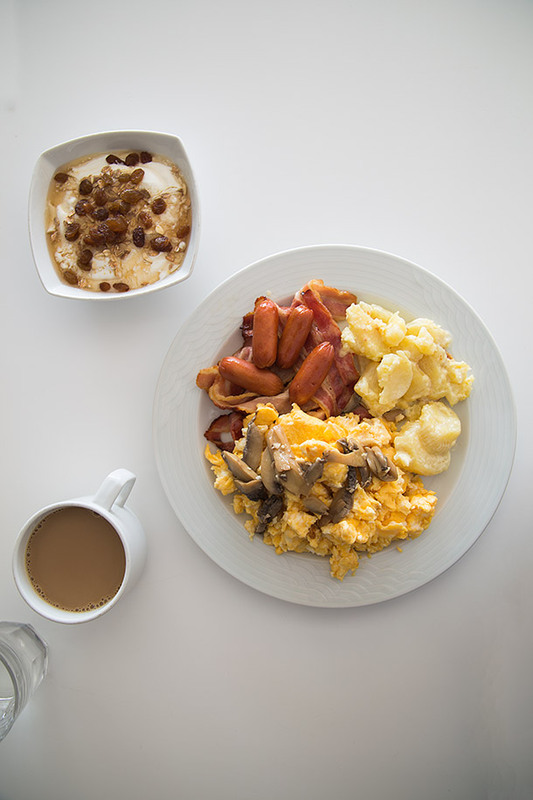 We woke up and had our included breakfast for our hotel which for me consisted of eggs, a lot of bacon, sausage, potato gratin, and greek yogurt with raisins, fresh made muesli and honey. I usually fast through breakfast but I couldn’t pass up these awesome breakfasts. The peculiar thing to me was that this day was incredibly windy yet the windmills didn’t move whatsoever. 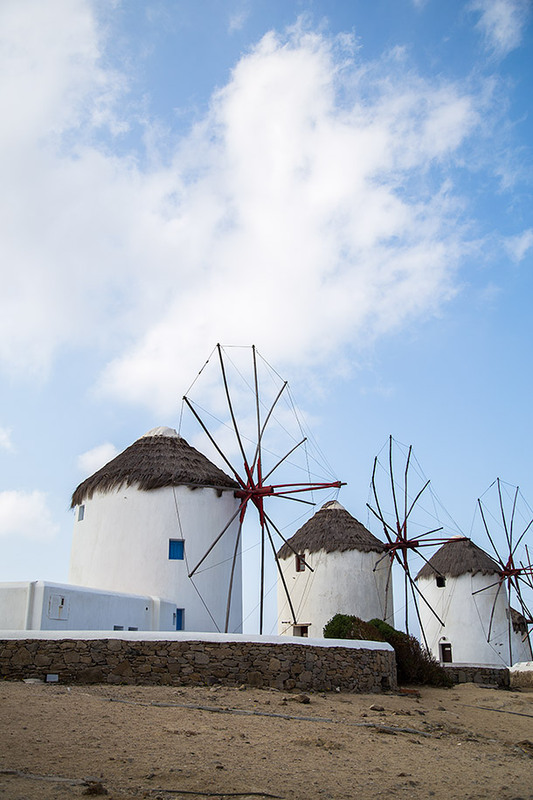 The windmills actually overlook the famous “Little Venice” of Mykonos. 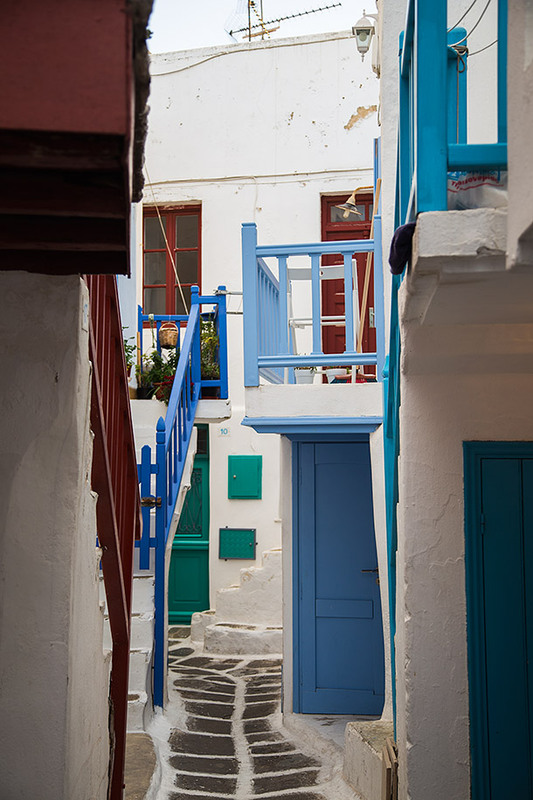 There is a slight resemblance of Venice for sure, but with a large splash of Greek style in there. We moved on and bussed to Paradise Beach, a well known party beach, with our friends. They’re pretty adorable, aren’t they. Matti is on the left, Phoebe is in the middle, and Matilda is on the far right. 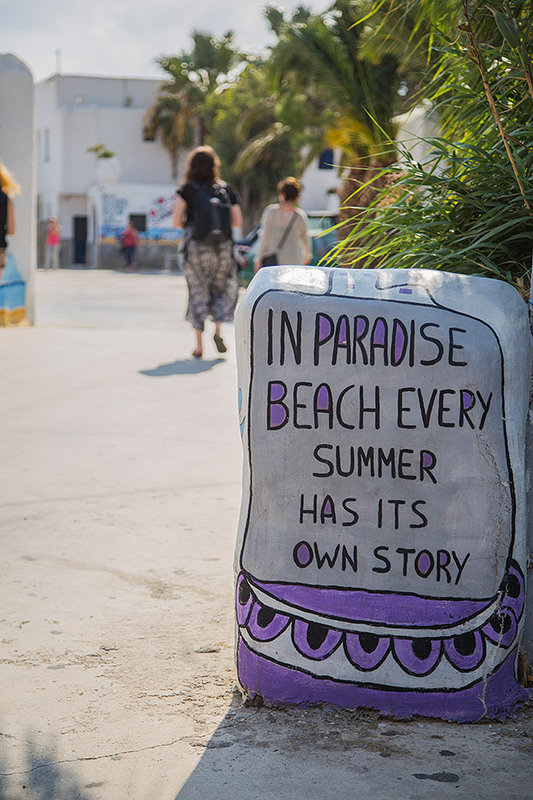 Walking to the actual beach was a delight since along the way there were rocks, walls, and medians painted and decorated with little quotes and sayings about the greatness of the beach. It did a great job to amp up the excitement to make it to the actual beach. Ironically we only spent about 30 minutes or so at the beach total and then decided we were hungry so we had to bus out and leave. 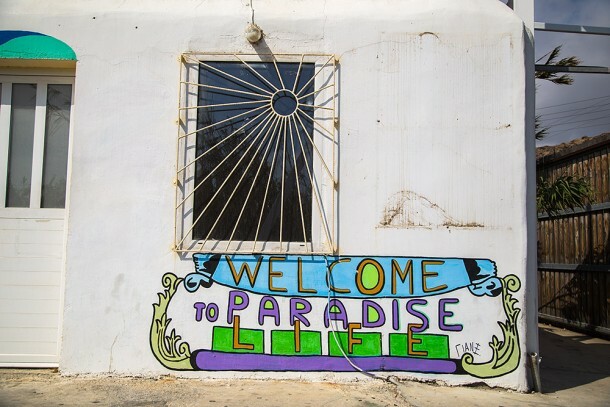 Once we returned to the bus stop from Paradise beach we began our search for a restaurant to eat. While we were looking we were stopped in our tracks by a pelican literally walking into a restaurant. Since when are pelicans allowed to enter restaurants? I wasn’t sure if they even saw it at firstbut after a few minutes, it became clear that this pelican was a regular, and sure enough, they fed it. 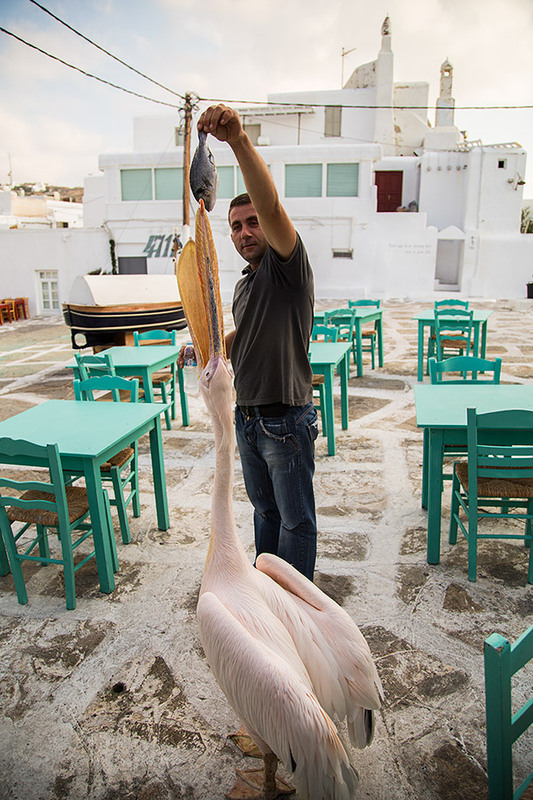 According to the restaurant waiter the massive bird has been coming every day for years because he knows he will be fed a delicious lunch of raw fish. Although I think he’s just lazy and likes to have his food handed to him rather than go out and catch it himself. He offered us a fair price for lunch and we were somewhat dazed from what just happened so we sat down to eat there. 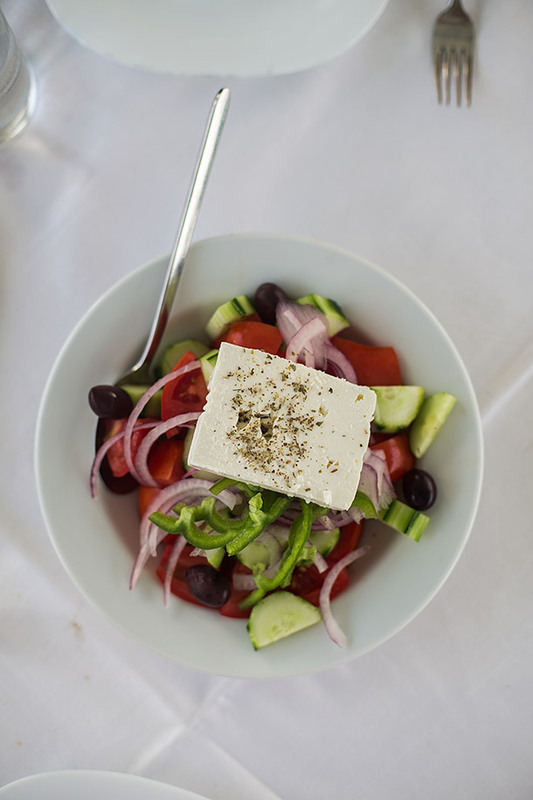 Of course we started with a typical greek salad. Delicious as always although they gave quite a small bit of feta in comparison to most restaurants in Greece. 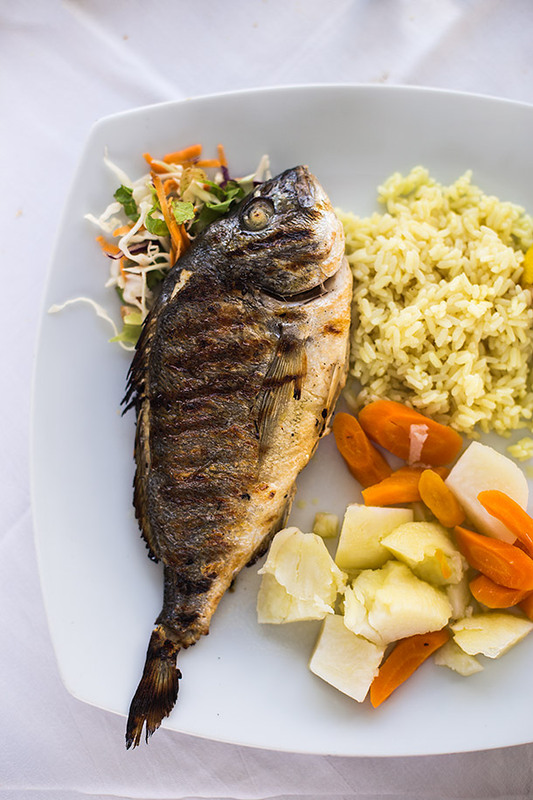 Next was my main of grilled bream, rice, and vegetables. The bream was perfectly seasoned and incredibly tender although the vegetables were not seasoned at all. Over all it was fairly nice and satisfying yet light, the only downside was that I had to season the vegetables myself. 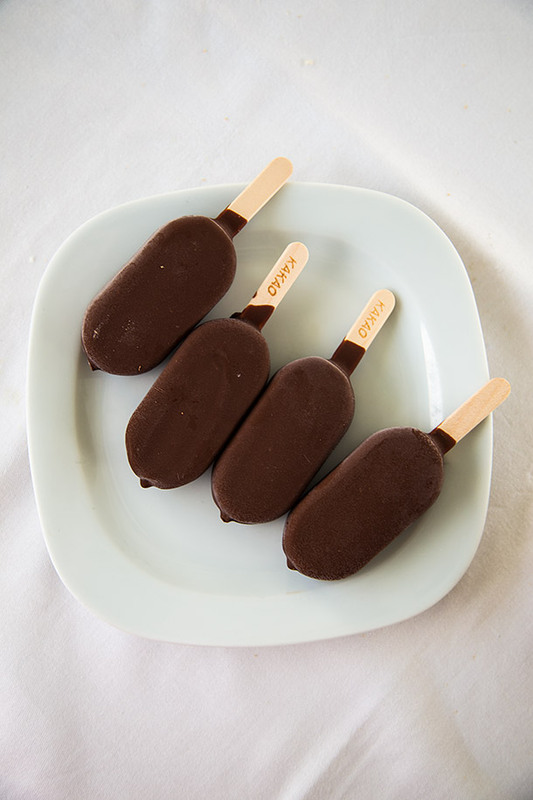 When we asked for the bill they brought out a chocolate dipped ice cream bar for each of us that we didn’t order so we assumed it was just another generous restaurant owner and happily ate our treat. Once we had finished the ice cream we perused the check to make sure we were splitting it correctly when we noticed that they in fact charged us for the ice cream. Nice. We had already planned to get ice cream after, so the girls still went and grabbed some while I grabbed some local frozen greek yogurt with honey and almonds. 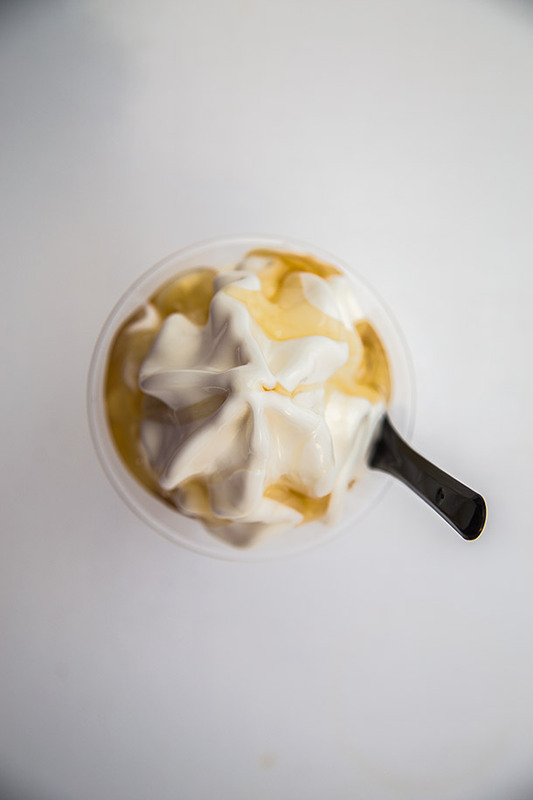 The yogurt itself was wonderfully smooth and flavorful and the aromatic honey and crunchy almonds were a nice touch. 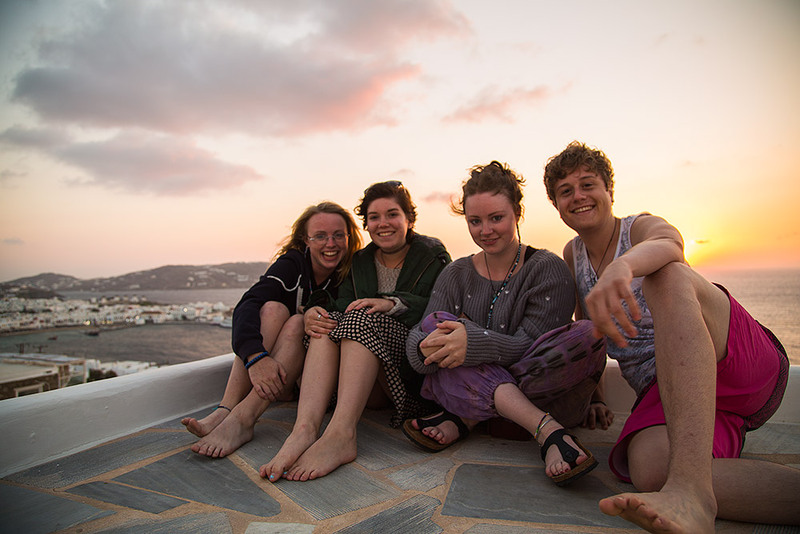 Once we had finished wandering the beautiful town area, we went back to Phoebe and Matildas hotel to watch the sunset together. We relaxed, laughed, took countless selfies together, and horsed around like everyone should during a quiet sunset. The following day Phoebe and Matilda planned to come to our hotel to walk around and eat. 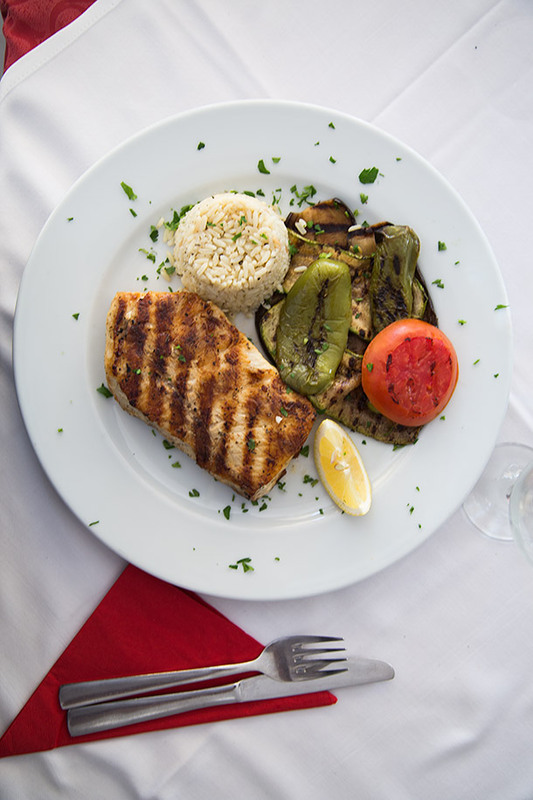 We stopped at a nearby restaurant and I ordered their fresh caught grilled swordfish with rice, zucchini, and peppers. The fish was cooked to perfection and was wonderfully tender and seasoned quite nicely. After our lunch, we climbed some large rocks next to the oceanside to gaze across the never-ending sea. Well, we did until we got tired and went back to our hotels. All of us relaxed for the rest of this day since the next day was going to be a travel day to Santorini. 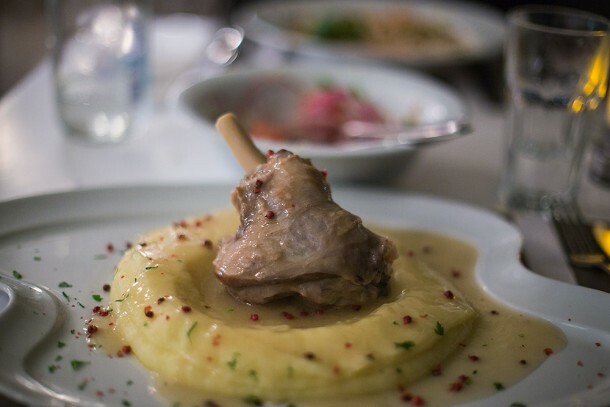 My last meal in Mykonos was a braised lamb shank with celery root puree and red peppercorns. 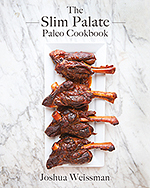 Since braised lamb shank is one of my favorite meals of all time, I really loved this. 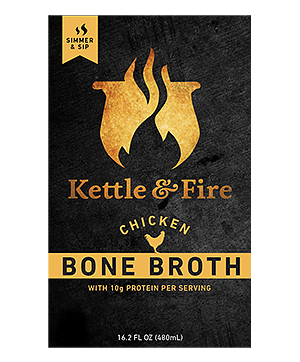 The meat was nicely coated in the umami packed sauce, and the celery root puree was smooth and satisfying, and all of it really came together with the occasional crunch of the fruity red peppercorns. For now I bid Mykonos Adieu, up next is Santorini. So gorgeous! Greece is so beautiful and I can’t believe I’ve never been since I’m so near! 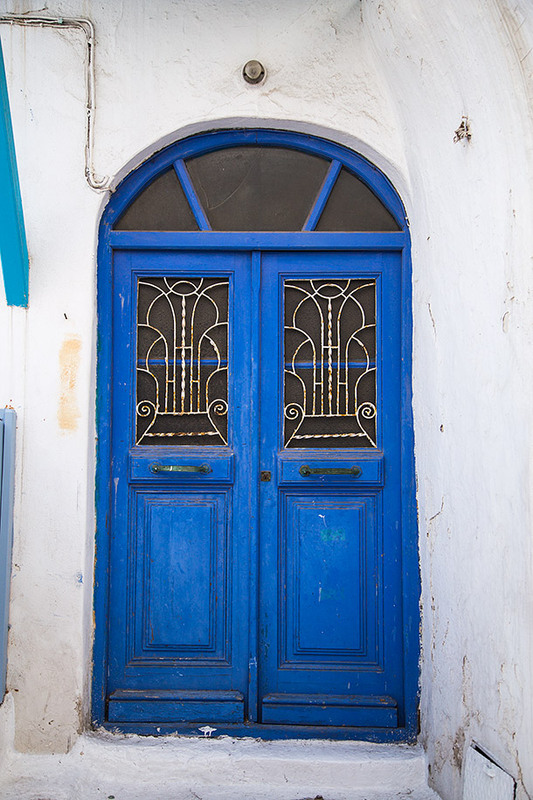 Your photos are beautiful – I want to visit Greece now! 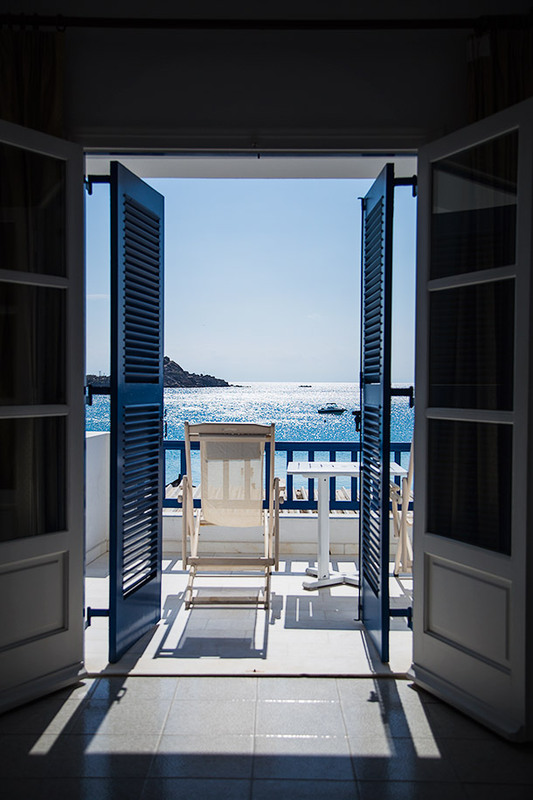 Do you mind sharing the name of the hotel where you stayed in Mykonos? Thank you! The hotel I stayed at was The Acrogiali Hotel, check it out here. Your article is very nice and I see how you tasted the Greek flavors provided by Greek cuisine, apart from the known souvlaki !! Did you meet your friend Pellecan the bird with vip services in Mykonos, since we all provide everything !! I suggest that you also visit Delos if you rent a boat in Mykonos is only 20 ‘away!